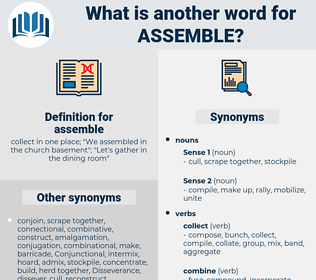 What is another word for assemble? collect in one place; " We assembled in the church basement"; " Let's gather in the dining room"
compile, convene, congregate, meet, consolidate, combine, obtain, accumulate. lay, muster, compile, convene, amass, Organizing, congregate, unite, mobilize, meeting, construct, Establishing, reunite, summon, meet, consolidate, amalgamate, arrange, combine, mobilise, orchestrate, ascend, merge, mobilizethe, equip, garner, climb, solicit, coalesce, form, marshal, obtain, accumulate, join, bundle. separate, distribute, lose, scatter, divide, spread, take apart, disperse, cancel. destroy, break, stop, raze, demolish, disconnect. knock-down, discharge, Ruinate, explode, depart, strike, ruin, send, leave, prorogue, flatten, split, smash, level, dismiss, disengage, blow up, wreck, detach, take off, dissolve. I remained on shore with a few men to assist in sorting out and making a list of the articles rescued yesterday and to assemble them in the best place suitable for their preservation. We have seen an ingenious teacher assemble a class of children around her large table, to each of whom she had given the blocks. reassemble, comfit, jumble, configure, confect, mix up, compound, confection, confuse, rig up.